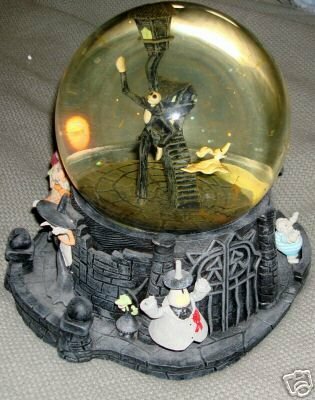 Nightmare Before Christmas 2001 Jack & Zero Snow Globe. Awesome snow globe featuring our hero of Halloweentown Jack Skellington and his trusty companion Zero the ghost dog. Jack and Zero are in the globe along with Jack's house. On the outside base are many of Halloweentown's citizens such as the Mayor, Sally, a witch, Mummy and the vampires . This is a very large Jack & Zero Snow Globe measures over 8" tall and is very heavy. This snow globe is made by NECA.